The Town Branch Park is part of the larger Town Branch Commons project, which proposes to uncover Lexington's long-buried Town Branch Creek. 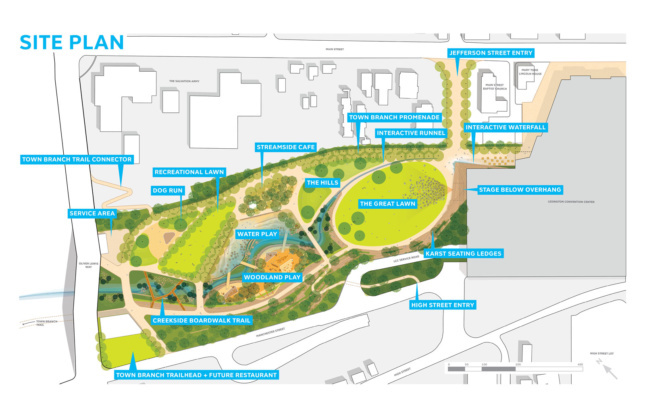 New York–based SCAPE Landscape Architecture has released new images of an urban park in the heart of Lexington, Kentucky. The city, working with the Bluegrass Community Foundation, has spearheaded the project which will completely transform one of Lexington’s main public spaces. The Town Branch Park is part of the larger Town Branch Commons project—originally featured in The Architect’s Newspaper’s October 2016 issue—which proposes to uncover Lexington’s long-buried Town Branch Creek. By revealing the waterway, the city will gain a new large-scale green space, complete with natural and artificial water features. The park will become a major part of the Town Branch Greenway, which connects existing downtown parks. The downtown portion of the Greenway is also being designed by SCAPE. When complete, the system of bike and pedestrian trails will stretch over 22 miles. SCAPE’s initial design for the project was picked in a design competition in 2013. Now that the project is moving forward, SCAPE has amassed a team that includes AECOM, Lord Aeck Sargent, Gresham Smith Partners, Element Design, and Beiderman Redevelopment Ventures.